In 1923, Shinjiro Torri decided to bring Japan a Whisky full of true Nippon essence – inspired by the Highlands of Scotland, but born in Kyoto. Then, in 1989, the year of tectonic changes in the world, Suntory Hibiki is released, starting an era of Japanese Whisky renaissance and an arms race to perfection. 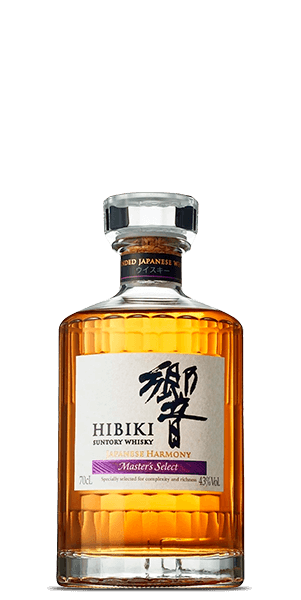 Hibiki Whisky is a masterful blend of Yamazaki Malt, Hakushu (matured in American oak, Mizunara oak, and Sherry casks), and grain Whiskies from Chita. It’s a harmony of characters and flavors; a supergroup or an orchestra of the finest Spirits. Okay, all this sounds cool, but is it any good? Hell yeah, it’s good. This Master’s Select is exclusive and limited, and since Hibiki itself is one of the most prestigious Japanese Whiskies, and this expression is their ritziest, you’re in for an elite treat. What does Suntory Hibiki Harmony Master's Select taste like? The Flavor Spiral™ shows the most common flavors that you'll taste in Suntory Hibiki Harmony Master's Select and gives you a chance to have a taste of it before actually tasting it. Vanilla-forward nose with fruity notes joined by wood spice and coconut. Vanilla and honey opening followed by caramel, citrus, chocolate and spices. Short but complex, slightly oaky. Sweet caramel on the nose, but somewhat salty on the pallet. Aftertaste is medium with strong oak and hints of vanilla. Very interesting whiskey. Great taste and just enough bite. Smooth finish. A sweet and Smokey treat, surprisingly complex yet not over powering. Very good! Strong but with the right amount of sweetness and pleasant bite. Enjoying with a Italian pastry. Definitely wood aromas. An explosion of taste upon the tongue! A deceptively complex whiskey that blends the sweetness of fruity overtones with a smoky, peppery backbone. This is a must have for any whiskey drinker that prefers their pour straight or neat! Smoky with light oaky hints. Floral tastes with touch of honey and caramel. Lovely but a little too powerful for a perfect score. Light body with the sweetness of plums, vanilla, and oak. This is the most elegant and (at the risk of sounding sexist) feminine blended whisky that I've had. I don't mean this is a "girly drink" or it takes like cupcakes. This whisky has many qualities you'd associate with feminine scents like vanilla and floral characteristics. There's also a gentle sweetness that carries this whisky from beginning to end. Perhaps if you are used to big Scotches, this may be a turn off. You really need to take this whisky as it is and enjoy it as a brand new experience. As Suntory's flagship blended label, Hibiki is unapologetic in its artistic vision. And it's execution is spot on perfect.